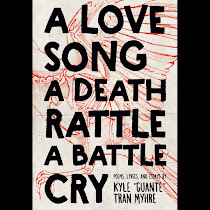 Guante: Updates: Big Poetry Show, Essays on Feminism & Boycotting the B-Word, Fall Booking and more! Updates: Big Poetry Show, Essays on Feminism & Boycotting the B-Word, Fall Booking and more! I'm the coach this year, and these young artists are spectacular. 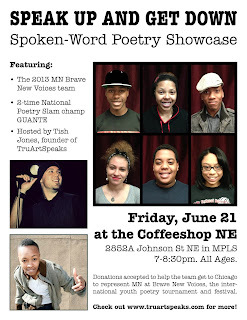 Come see them (and me) perform at the Coffee Shop NE in MPLS this Friday. That spot just remodeled and it's really great venue for this kind of show. 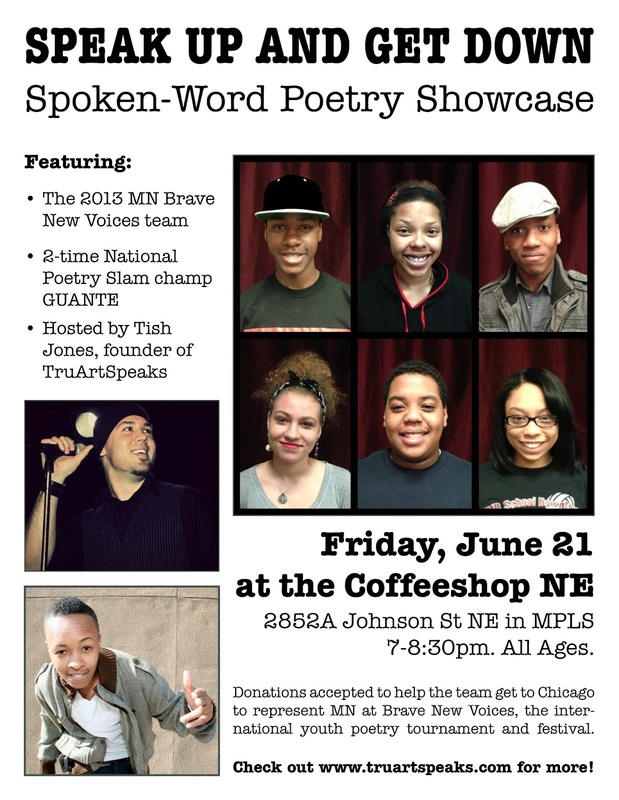 If you can't make it, you can still help get this team to Brave New Voices in Chicago; we still need to raise some more money to cover travel expenses, and BNV is a life-changing experience for young leaders... so your donation is definitely going toward something positive. I'll be going to BNV this year too, so if you're in Chicago, get at me. I still have a weekly column over at Opine Season, and this month I've been focusing on gender/feminism stuff. My piece on MRAs is getting enormous amounts of traffic, and as followups I've written a piece on why I'm thankful for feminism and a piece on my decision to boycott the b-word. If you like them, feel free to repost! I know a million people with a million kickstarters, and they're all worth contributing to. But this one is something special. Patrick (also known as PCP) is an MC/singer/producer; he's also a videographer (he shot the To Young Leaders video, as well as many of my live spoken-word videos); he's also just a beautiful human being. After his father passed away unexpectedly, he's made it his mission to document his father's art, 2000+ paintings. His kickstarter is about being able to set up a digital archive and more. It's an inspiring testament to the power and importance of art, and I hope you'll consider pitching in. I want to come to your school. Aside from the whole spoken-word/hip hop thing, I facilitate discussions and give presentations on a range of social justice issues, from gender/masculinity stuff to race/white privilege stuff to the relationship between art and activism and much more. I'll perform, lecture, keynote, facilitate, or do all four in one visit. Check out my booking info here, and get in touch at elguante@gmail.com. 5. New Videos, New Music, New Poetry, MORE! Kind of in calm-before-the-storm mode right now. Seven (!) videos on the way in the next few months, from brand new songs and poems to a couple tracks from You Better Weaponize. I also have a new EP called SIFU HOTMAN and a new mixtape called DUNGEONS both to be released before the end of the year. Details and previews for both coming soon! As always, follow on Twitter of Facebook for more frequent updates, links to cool stuff, and random nonsense.